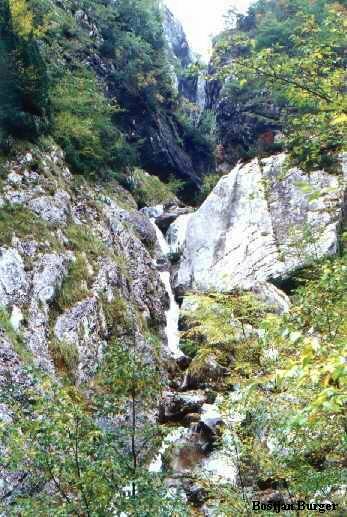 Slap Kloma is a waterfall in the Northwest of Slovenia on an altitude of 755 meters, near the town Trenta. With a single fall of 128 meters it is one of the highest waterfalls of Slovenia. The total descent of all falls is 186 meters. Slap Kloma is the first in a series of waterfalls in the river Klama or Kloma, which originates at an altitude of 1500 m in the eponymous gorge in north-western wall of the Grand Vršovca. The most beautiful view to Kloma is from Mali Vrsic. Here you will have a good view on the gorge which is very steep. There are no path and climbing along the fall requires climbing experience. The river Klama is a low volume river and is best to be visited after heavy rainfall. In spring or autumn there is also a change of any significant volume in the river.